Apple is without a doubt known to nearly all living souls across the globe and this popularity can be attributed to one thing: the iPhone. The Cupertino Company has been setting standards in the smartphone world for more than a decade now. The first iPhone was made public back in 2007 and 10 years later, Apple now sits comfortably on top of the revenue charts, well ahead of not only other tech giants such as Alphabet and Microsoft, but also above the rest of the industry’s top names, generally. According to an infographic published by Visually, Apple makes a whopping $1,444.76 per second. This is simply insane, but it’s not surprising at all. What makes the report interesting, though, is the gap between what Apple makes per second and what other companies in second and subsequent positions make. The infographic compares up to 25 different companies from different sectors: retail and consumer goods, technology and internet, telecommunications and mass media, banking and finance, medical and pharmaceutical, oil, gas and cars, and tobacco industries. Apple, as expected, leads the way, followed from a distant by JP Morgan Chase, which makes $782.14 per second. To complete the top 5 positions are Berkshire Hathaway, Wells Fargo and Alphabet, which make $761.30, $693.75 and $615.96 per second, respectively. In short, Apple makes more than two times what its closest competitor in the tech industry, Alphabet, makes. 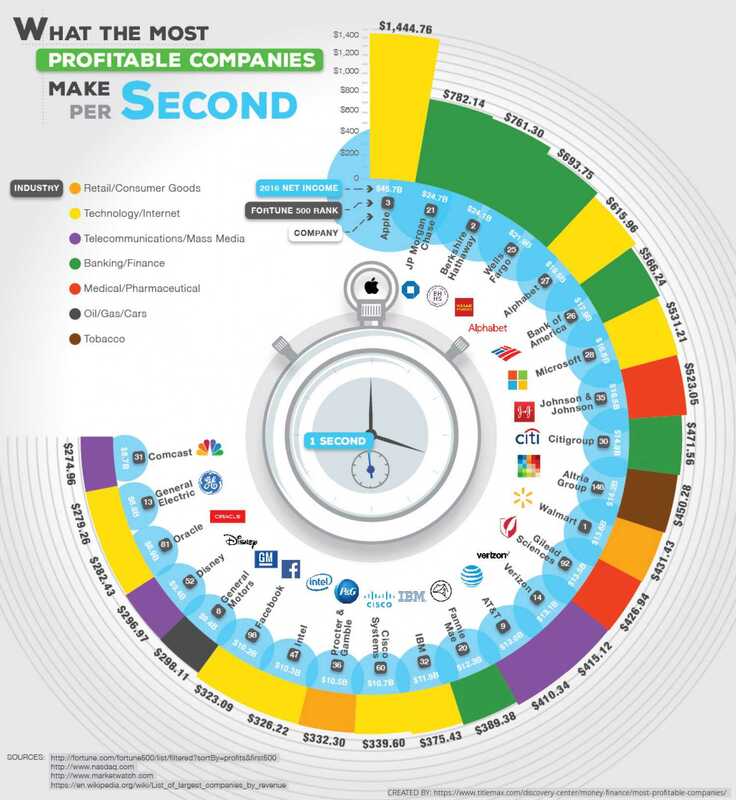 In the tech space, Microsoft is ranked third with an income of $531.21 per second while Facebook makes just $323.09 per second. The most profitable carrier in the U.S. is Verizon, which earns $415.12 per second and AT&T comes in second with earnings of $410.34 per second. It’s not strange that these two carriers are high up on the list of top-earning telcos. The two are the largest in the country and have the widest coverage, which makes it a no-brainer that they are also way ahead of the likes of T-Mobile and Sprint, which did not make it to the list of top 25 earners.